This tutorial will show you how to build an Internet controlled robot with a live video stream to a custom site hosted by the ESP32 Thing. 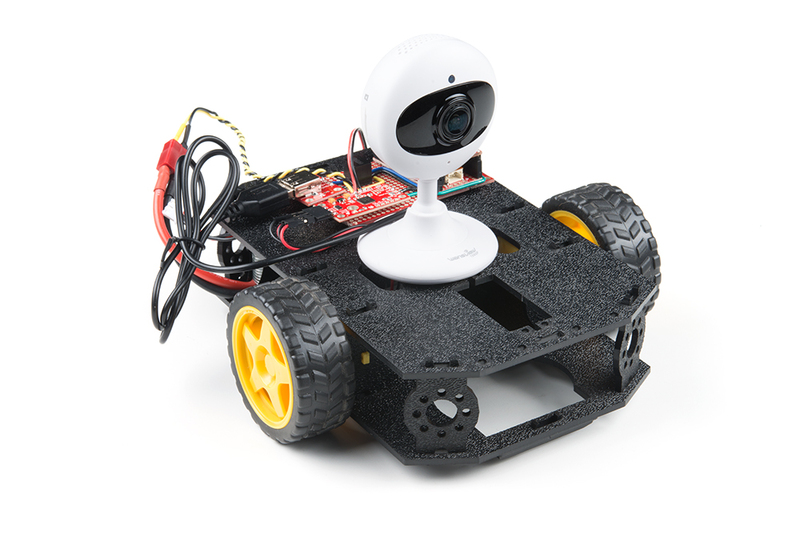 With a little hacking you can customize the robot to create your own pan/tilt camera or even a Nerf Sentry Gun that can be remotely controlled! This project is based around the Shadow Chassis, which is controlled by the ESP32 Thing and the Serial Controlled Motor Driver. Power supply voltage: Ideally the camera can be powered from USB, so that the ESP32 and camera can share the same 5V rail. 2.4GHz WiFi connection: So that the ESP32 and camera can share the same network. Framerate: Higher is better. The best I was able to find was 30 frames per second, but due to real world conditions, expect it to be around half of what is outlined in the technical details. Accessible with an HTTP link: For this you'll have to do some googling, but if you type in the manufacturer and model number followed by "URL" (e.g. "Wansview 1080p URL") you should find a link that will show you what to put in the address bar of your browser to view the video stream. We'll discuss how to use that URL in the camera testing section. Before starting this project, there may be a few subjects you'll want to be familiar with before starting this project. All that's needed for this tutorial is assembling the chassis and mounting the motors. It's good practice to do a few sanity checks as you put this together. Warning: Connecting the battery voltage to the 5V rail will break the ESP32 Thing and might break your camera. Start with the battery connections and build up to the 5V DC/DC converter. Once the DC/DC converter is in place, measure the output voltage and make sure you're seeing close to 5V. Power is supplied from the 7.4V (2-Cell) Lipo battery. Running Lipo batteries down below a safe voltage (3V per cell, or 6V in this case) can cause damage to the battery which can cause it to fail or shorten the life of the battery. To make sure we don't run our battery flat, we'll use a panel voltmeter to monitor the battery's voltage. At 6V, the battery is considered flat, and needs to be recharged. According to the DC/DC converter's datasheet, the regulator has an input voltage range of 7-28VDC, but in my testing the regulator will work as low as 6.5V. Below this input voltage, the regulator will output 0VDC, so you will need to change the battery when the output voltage drops below 6.5V. The raw battery voltage is also directly fed into the Serial Controlled Motor Driver (SCMD), which can handle up to 11V to drive the motors. The SCMD can run off 5V, but with a lower voltage the motors will draw less current, which will extend battery life, but have less torque and move slower. To power the ESP32 Thing, Motion Shield, and Camera, we'll need to regulate the battery's voltage down to 5V. To do that we'll use a 5V DC/DC converter which has 3-pins: VIN, GND, VOUT (see pinout above). VIN is the battery voltage which should be between 6 and 8.4V, VOUT is 5.0V, and GND is GND. The DC/DC converter is recommended over a standard LM7805, because it is more efficient than a linear regulator and extends the battery life. 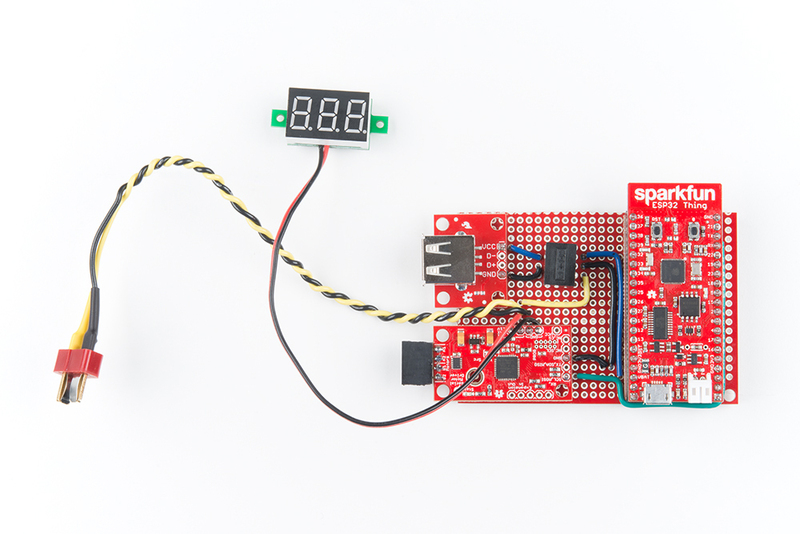 With a linear regulator the wasted power is converted to heat, and with the ESP32 and camera drawing around 500mA of current, a linear regulator (such as the LM7805) would be hot to the touch. 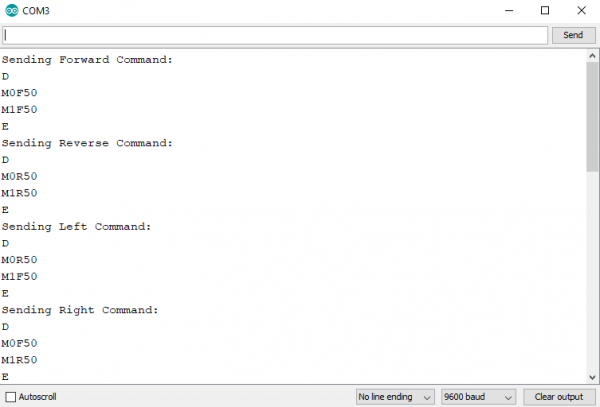 If you haven't uploaded code to an ESP32 before, check out the hookup guide to learn how to program the ESP32 Thing in Arduino. * to see how the motors respond based on the commands we send. Pay attention the messages stating which command was sent, and verify that what was sent reflects what happened. 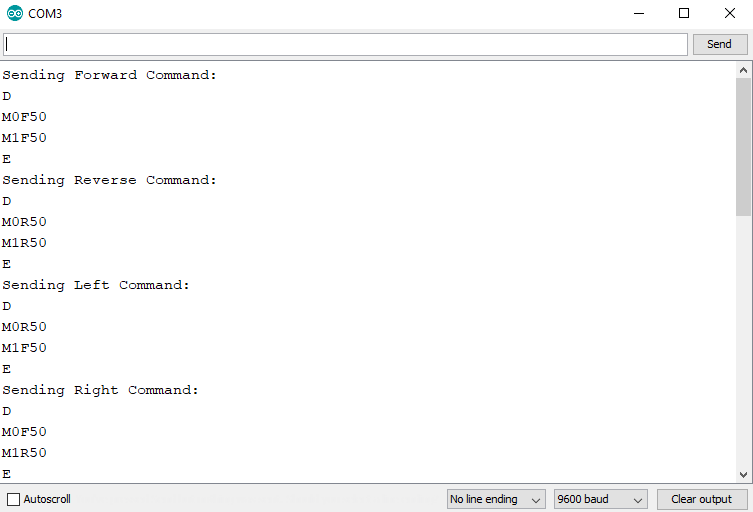 If nothing moves, make sure you have power connected correctly and your motors are connected to the SCMD, and that you set the baud rate to 9600 in your Arduino sketch (not just in the terminal window). If one (or both) motors spins in the opposite direction than it should, you can fix it by swapping the motor connections to the SCMD. Another option is to correct it in software. If the forward command was sent but motor0 spins in reverse, replace M0F50\r\n with M0R50\r\n. Another possibility is if the forward/reverse commands work, but the left/right commands are backwards, swap the M0 and M1 in the left and right command blocks. If you need to make changes in the software, remember which ones need to be changed when we add code to the final example. Note: You'll need to replace the * for the SSID and password with the name of your WiFi network and it's password. If you modified the motor commands from the previous example to work with your motor wiring, you'll need to apply those changes in the `handleMotors()` function as well. *  to control the motors. *  number and/or motor direction in the handleMotors() function. The Arduino code doesn't include any of the HTML code that your browser needs to display the web page. For that we'll need to load the HTML file on to a microSD card. You could also directly load the HTML code into the handleRoot() function, but by keeping the HTML code on a microSD card, we can eject the SD card and change the code, faster than it would take to recompile the ESP32 code and re-upload it to the board. If you only see "...", it means that it's not connecting to your WiFi network. Make sure the SSID and password is correct. If the SD card failed to initialize, it could be that you forgot to plug in the SD card, or it could be that the chip select pin is incorrect. For the Motion Shield it should be GPIO pin 33. From this page, when you press the arrow keys you should see the motors respond. As you press the arrow keys, check to make sure the motors respond correctly to the arrow keys. If not, you'll need to modify the code in the handleMotors() function to move forward when the up arrow key is pressed, reverse when the down arrow key is pressed, and so on. As mentioned at the end of the Introduction, you'll need to source your own WiFi camera, which makes it difficult to show you how to get image or video data from your camera into a web page, because each manufacturer will do things differently. To get started, you'll need to do some googling. Search for the manufacturer's name and the camera's model number followed by "URL" (e.g. "Wansview 1080p URL"), and you should find a link that will show you what to put in the address bar of your browser to view the video stream. snapshot (takes a photo of what the camera can see): “http://[IP ADDRESS]:[PORT]/mjpeg/snap.cgi?user=[USERNAME]&pwd=[PASSWORD]”. The first URL provides the video stream using the Real Time Streaming Protocol (RTSP). If you have a video player (such as VLC) installed on your computer, you can open a network stream with the RTSP link and fill in the specific information of your camera (IP address, port number, user name and password) to view the video stream. Now that the wiring works, the motors can be controlled from a web page, and we know the URL for our camera works, we can finally put it all together. All we need to do is eject the microSD card from our Motion Shield and change the HTML code on our computer. This tutorial is based on a blog post from a few weeks back. Check it out! Because this project is Open Source, you can expand on this project and make it your own. By adding port forwarding to your router, you could make the robot accessible from anywhere in the world if you have an Internet connection. Or maybe you want to replace the motors with servos to create your own pan/tilt camera, or even a nerf gun for a remote controlled sentry! Or if you're looking for another project to put your ESP8266/ESP32 to work, check out some of our other great tutorials!